Didn’t expect the sand dunes to be this big and empty. There were only another family besides us when we reached. If you had read my earlier post, you would have read that I had sprained my ankle halfway through the trip. That was also not the only thing that I did. 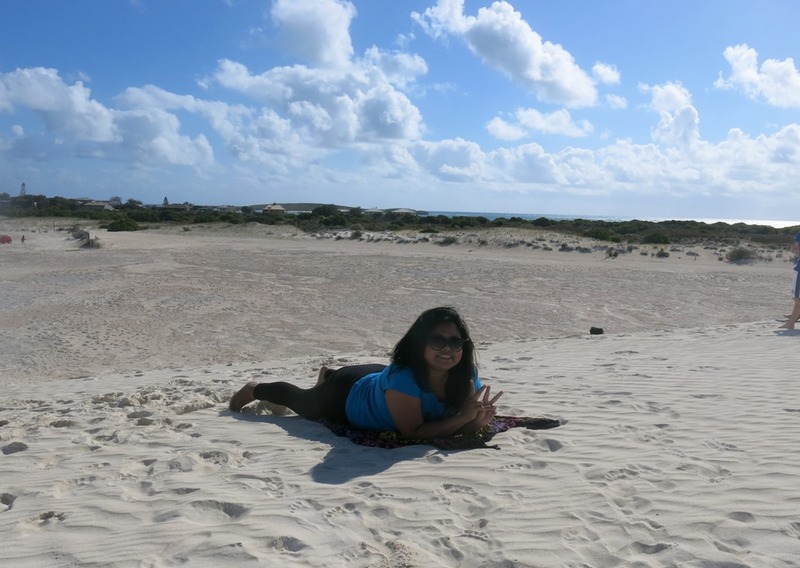 I got stubborn and refused to stop my plans for the trip and that included a trip out to Lancelin to try out sandboarding. Or at least tried to. It’s harder than I thought it would be to sandboard with an injured ankle. It is not easy to walk on sand. It is harder still to climb a hill of sand. It is worse when you try to do it on an injured ankle because the sand is so soft that you really have to exert a lot of pressure to move up. I did it anyway. Sandboard at your own peril! To sandboard down, you need to get to the top of the hill first. Not exactly the best idea to have when you have to climb that steep sand dune on an injured ankle. The thought of climbing all the way back up again after sandboarding down is not an appealing idea. When it hurts too much to stand on your injured ankle, the sand is perfect to roll around instead. Sandboarding down a steep (about 45 degree angle), uneven sand dune with an injured ankle sounds and looks scary. I chickened out, by the way. 🙂 It still made for a very fun albeit tiring walk up the sand dune, even if it is at our own expense. It is worth it to climb to the top if only for the views. The view from the top was just amazing and you could see far out in the distance. 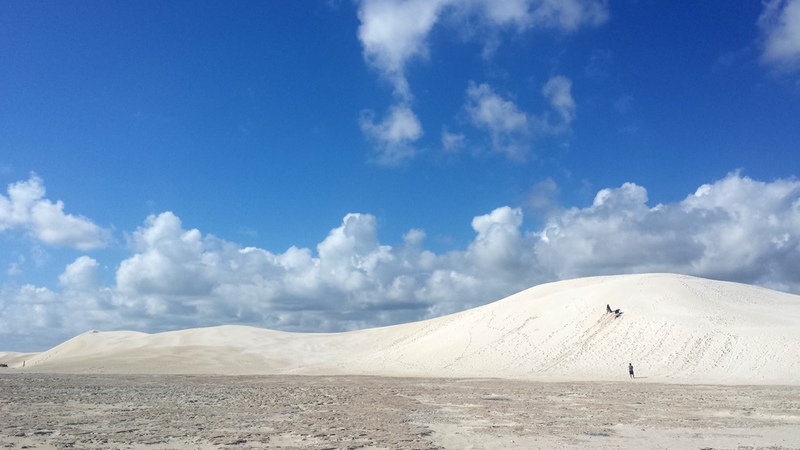 Up there, you get a panoramic view of Lancelin, its surrounding lands and a glimpse of the coastline. I would so do it again even if I had an injury because it was worth the climb to the top. We had fun playing with the sand up there, taking photos against the beautiful background and trying to slide my way down after. I do wish that I had spent more time there though as there were other sand dunes that were empty of people but there was only so much that I could do on my injured ankle. And honestly, it hurt more to walk on sand because your feet just sinks down on it. I had to really struggle up that one sand dune but the fun of it more than made up for it. 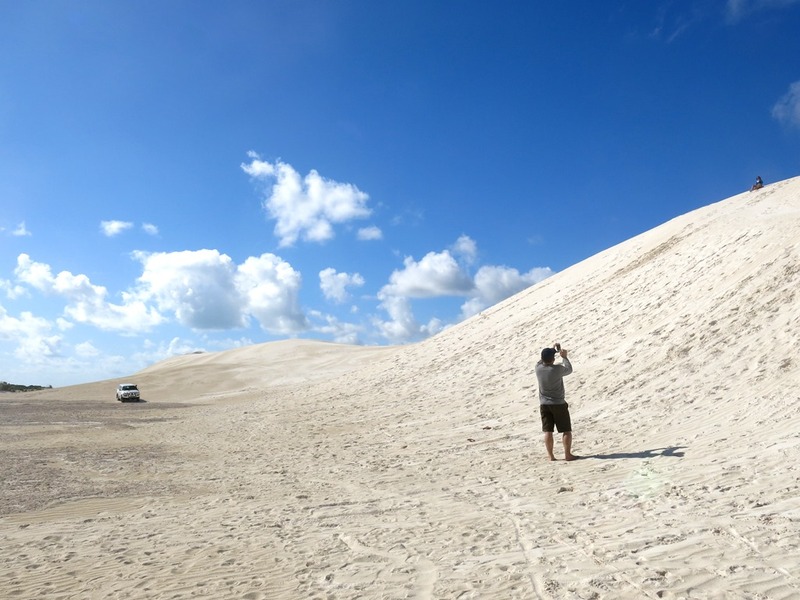 – Visiting Lancelin is best combined with a trip to the Pinnacles Desert. Lancelin is about an hour and a half drive north of Perth and the Pinnacles is even further than that. I got a chance to visit because my room mates were planning a drive up. 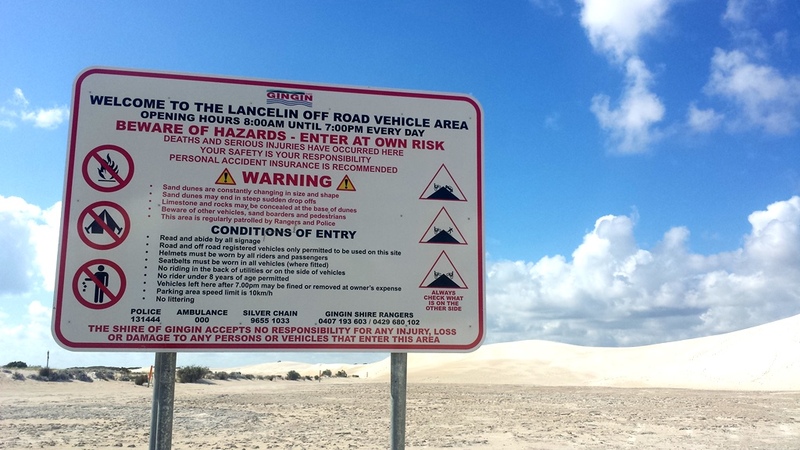 – There are no shops at the sand dunes itself so it’s best to stop by one of the convenience shops in Lancelin to rent out the boards first. We didn’t know that we had to rent one from there and only managed to borrow one from someone who was already there for a very, very short time only. – There were also no toilet facilities at the sand dunes so make sure to go before making your way there. There are toilet facilities at the nearest beach. – Be careful while sandboarding down. Like I mentioned, the sand dunes were huge and steep. Do note the opening hours on the photo above. Sand boarding sounds like heaps of fun….. though maybe not with a sore ankle. Love the contrast of the white sand against the blue sky. what amazing white sands! do the boards really get that fast when sandboarding? Should we use special suit for that? I am not sure, but it kind of sounds like trying to climb to the top of a hill in snow and sliding down. It is very tiring because you are constantly sinking down in the snow, but going down the hill at maximum speed is pretty awesome. An avid traveller who loves solo travel, seeks to explore the world and spread my passion of travel to others. I would love to hear from you, please do contact me at lifetomyfullest@gmail.com. N Seoul Tower – Bus, Hike, or Cable Car?